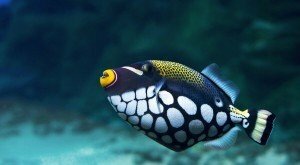 A review of important aquarium water parameters. Ammonia, nitrite, nitrate, pH, phosphate, silicate, chlorine, and water hardness. 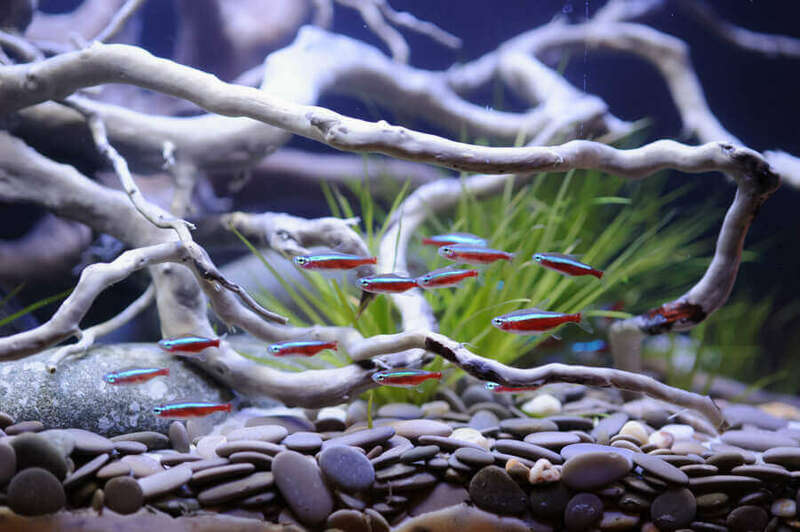 Stable and consistent water parameters are very important for a successful aquarium. Testing the water and understanding the results, provides a helpful snapshot of the aquarium’s vital signs and overall condition. 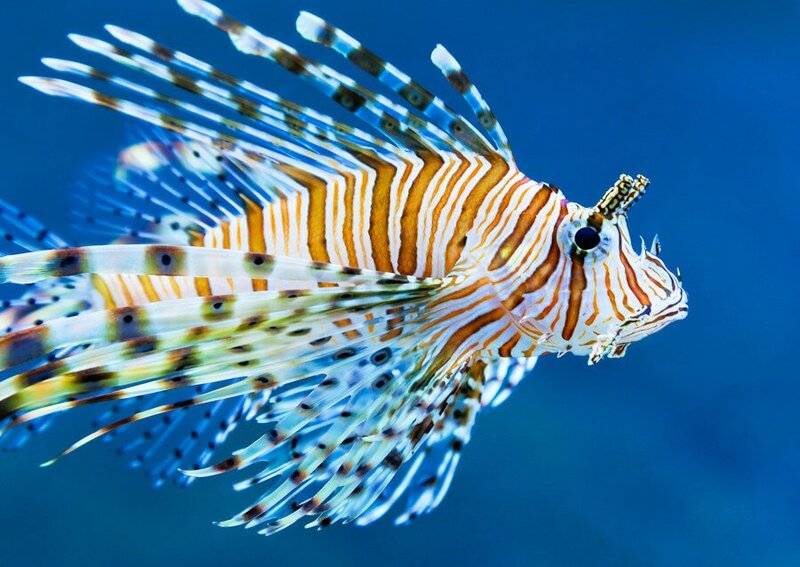 Nitrogen compounds that should be regularly checked in the aquarium include ammonia, nitrite, and nitrate. Buildup of ammonia results from nitrifying bacteria breaking down aquarium waste. 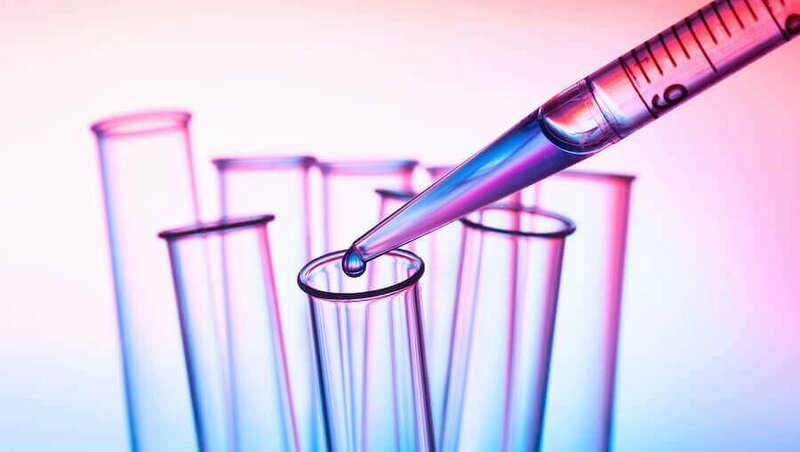 Ammonia (NH3) constantly converts to ammonium (NH4+), and vice versa, resulting in a total ammonia (ammonia-N), which most test kits measure. Once the nitrogen cycle establishes in new aquariums, ammonia should never be detectable. Detecting ammonia, after cycling is complete, requires immediate action. Even low concentrations of ammonia-N severely stress fish. It makes them more vulnerable to disease and shortens their life span. 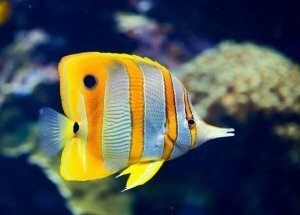 If ammonia is left to accumulate in the aquarium, it will be lethal. 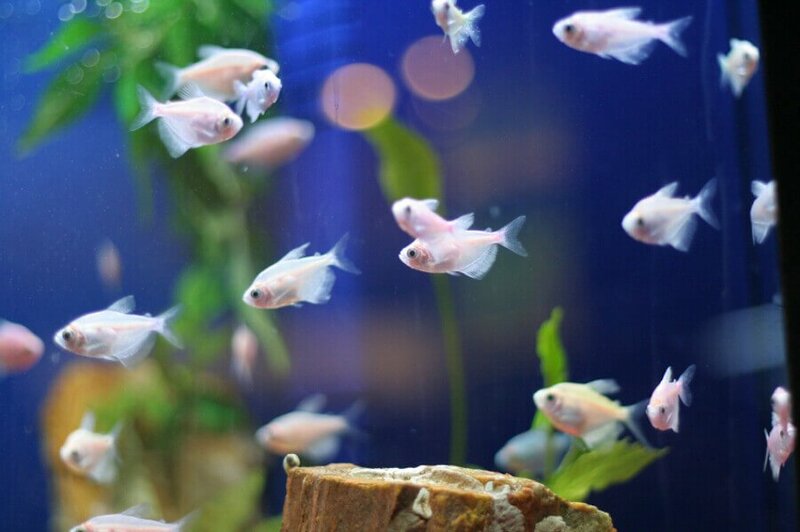 Ammonia is highly toxic in freshwater aquariums. It’s even more toxic in reef and saltwater environments, due to a higher pH. The higher pH results in the presence of highly soluble ammonia gas, which is significantly more toxic. The second stage of the nitrogen cycle produces nitrite. As soon as ammonia is available, nitrifying bacteria utilize the newly produced ammonia, enabling them to multiply and colonize inside the aquarium. Ammonia is predominantly converted into nitrite by the bacteria species nitrosomonas. Once ammonia converts into nitrite, the bacteria species nitrobacter converts the nitrite into nitrate. 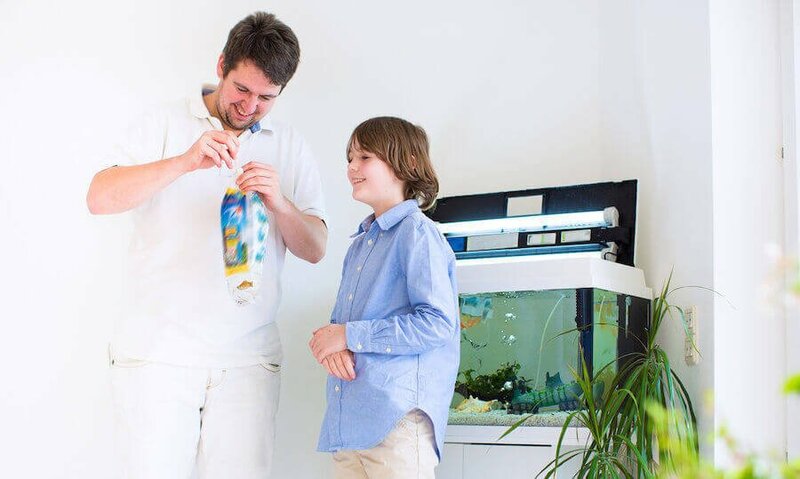 When a new aquarium is set up, the nitrogenous compounds will rise to high levels. This is unavoidable. While initially toxic, it is necessary so the bacteria can form a colony, thereby starting the waste conversion process called the nitrogen cycle. Nitrosomonas and Nitrobacter are aerobic bacteria, requiring a constant flow of oxygen in order to survive and to perform their tasks. 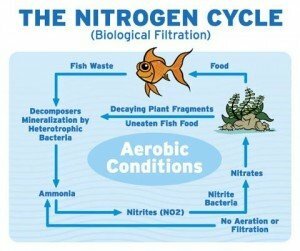 Nitrite should never be detectable in an aquarium once the nitrogen cycle has been established. While nitrite is not as toxic as ammonia, it will cause significant fish stress at levels as low as 0.5ppm. Persistent nitrite levels exceeding 10-20 ppm will be lethal over time. If nitrite levels remain detectable for more than 7 days, take immediate action to bring relief to the aquarium’s inhabitants. Nitrite interferes with the oxygen metabolism of fish. Eventually it will destroy the fish’s hemoglobin (oxygen carrying cells). 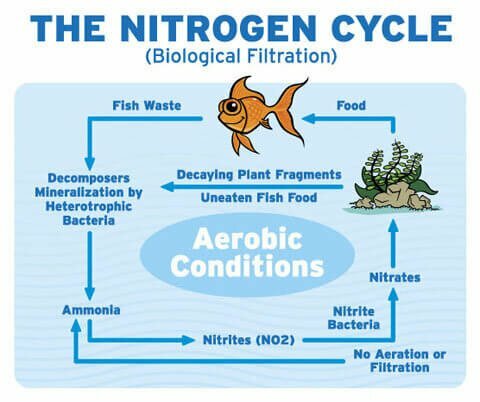 Nitrate is the third and final stage of the nitrogen cycle. As outlined above, nitrifying bacteria convert aquarium waste into ammonia > nitrite > and finally nitrate. 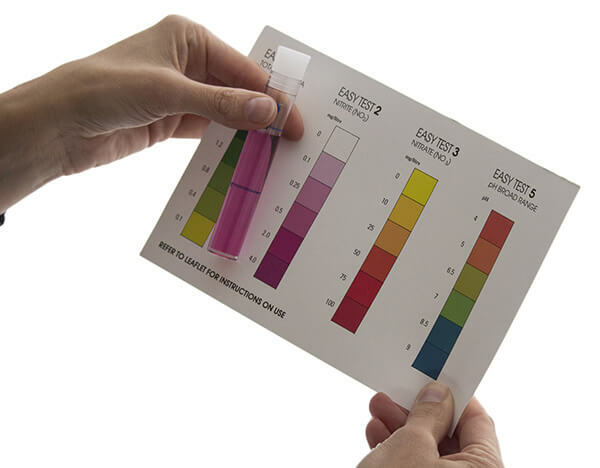 Unlike ammonia and nitrite, it is quite common to have some detectable levels of nitrate in an established aquarium. 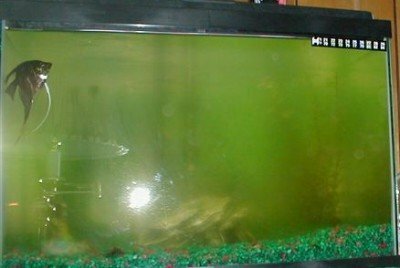 Nitrate is the main cause for algae growth and green aquarium water. Keeping nitrate low is the best preventive action a fish keeper can take to avoid ugly and messy algae outbreaks. Although less toxic than ammonia and nitrite, nitrate as a nitrogen compound still causes stress at all levels making a fish’s organs work harder to adjust to its new environment. The increased stress results in a lowered ability to fight disease, the ability to heal itself, and the ability to reproduce. While there is no cause for alarm when nitrate is present in the established aquarium, it is best to keep levels as low as possible. The lower the level, the less stress on the fish, as well as a much lower chance of algae and green water outbreaks. The water change is the most common method of diluting nitrate in the aquarium. However, it may not be enough. 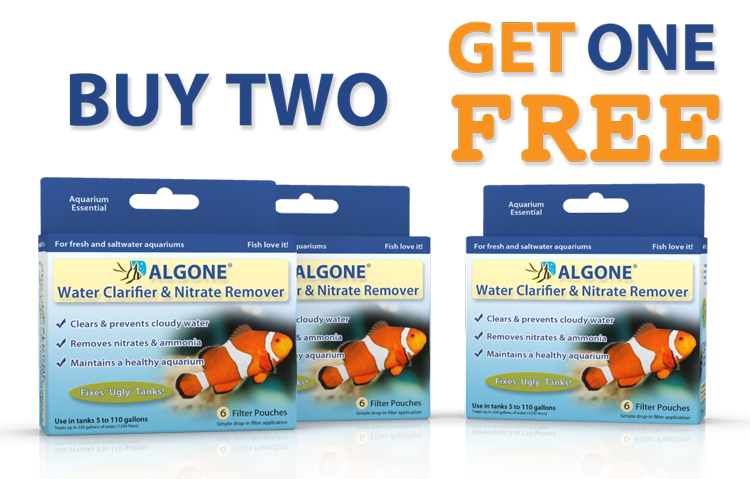 Using Algone in between water changes significantly reduces aquarium nitrate and also safeguards water clarity. pH is the measurement of hydrogen ions. Increased hydrogen ions equals less bonding, resulting in a pH drop (more acidic water), while a decrease results in a pH rise (higher alkalinity). pH = power of hydrogen. 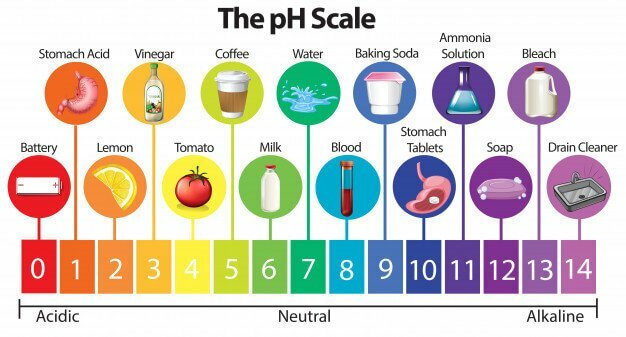 The lower the pH the more acidic the water, while a higher pH equals higher alkalinity. pH measures on a scale from 0 – 14. A pH of 7 is neutral. Changes in pH are a common cause of fish fatalities. 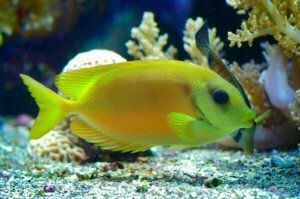 Fish can adapt to various pH levels, provided it’s not too far out of the ideal range. Generally, a pH range from 6 – 8 is suitable for most species. However, fish can not tolerate a constantly changing pH range. This is because pH is logarithmic (mathematical – meaning ten-fold). In other words, a change in pH from 7 to 6, results in water 10 times more acidic. An additional drop to a pH of 5, results in water 100 times more acidic than the neutral starting point of 7. If you have to adjust your aquarium’s pH, you must take carbonate hardness into consideration. The pH of harder water is more difficult to adjust because it bounces back, while softer water is more easily adjusted. 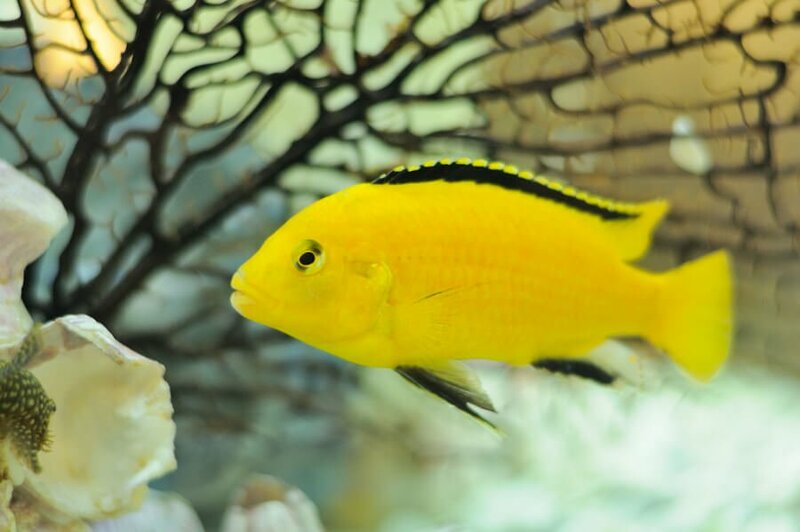 Make sure any pH changes are incremental, allowing your fish to adjust accordingly. The goal should always be to maintain a steady pH so adjustments can be avoided altogether. GH primarily measures calcium and magnesium ions. Water hardness is important for breeders. Some species require very soft water, which is hard to maintain. Successful breeding will require constant monitoring. For the average fish keeper, monitoring water hardness is not all that important. The main significance is to choose fish suitable for existing water conditions. Common measurements use ppm and the equivalent mg/l. To convert degrees into ppm, simply multiply by 17.8. KH measures dissolved bicarbonate and carbonate ions. They are commonly referred to as the buffering capacity. KH is very important because it determines how stable your pH is. Carbonate ions bond with hydrogen ions, which is your pH. Increased bonding results in a higher pH, while fewer carbonate ions results in a lowered pH. A KH of 70 ppm and less, will result the pH crash. Baking soda will increase KH, hence it will increase pH. Distilled water has a KH of 0 and therefore will lower the KH. We recommend not to adjust KH, unless absolutely necessary. If an adjustment must be made, it is critical to make slow, incremental changes. KH and pH should be frequently measured during this adjustment phase. 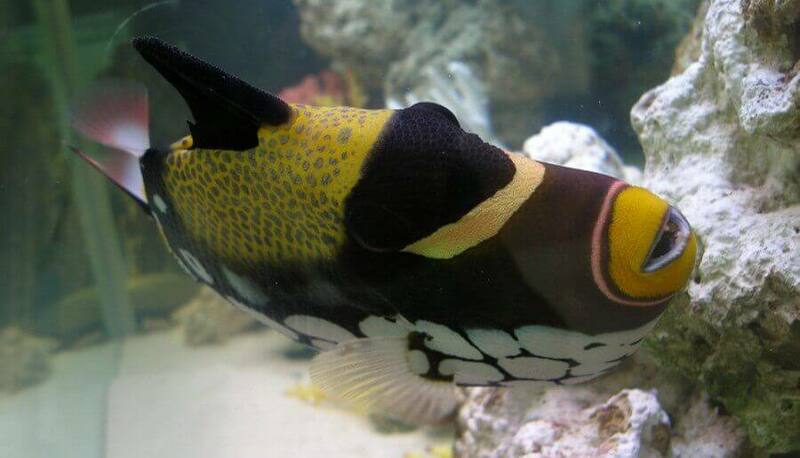 Changes must be small enough to allow your fish to fully adjust before continuing with the next adjustment. An incremental adjustment of 0.5 pH should be safe. Depending on the required total adjustment, this process should take days rather than just hours. Phosphate originates from within the aquarium. It is a by-product of the mineralization of waste materials, including those from plants, bacteria, fish excrement, uneaten food, fish slime, etc. Dead plant matter and rotting food particles settle on the substrate and within the filter. Rinsing filter materials and vacuuming the gravel during routine aquarium maintenance, significantly reduces phosphate accumulation by removing these internal sources. Water companies use chlorine and chloramine to disinfect tap water. 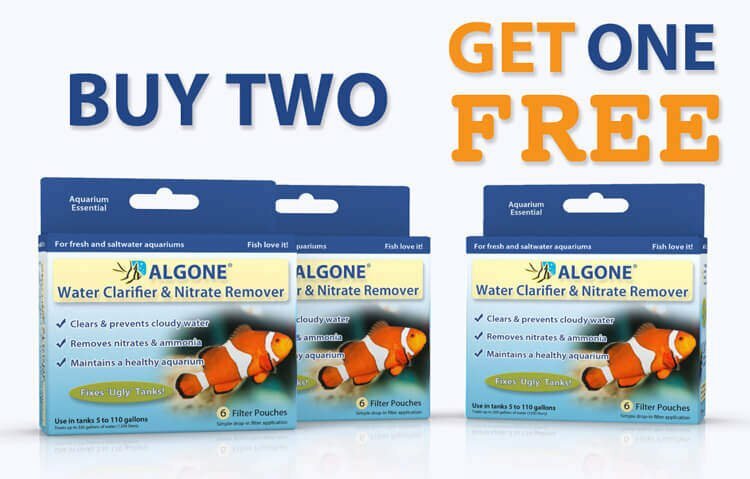 Because both are harmful for fish, you should neutralize them prior to aquarium use. While chlorine airs out rather quickly in an aerated bucket, chloramine does not. Chloramine, a mixture of ammonia and chlorine, passes through the fish’s tissue directly into the bloodstream. Once in the blood, it destroys oxygen carrying cells. Exposure to chloramine can kill all fish within 24 hours. Be sure to use a quality water conditioner to make the water suitable for fish life. What is the acceptable level of phosphate in aquarium freshwater? Simplified, hard water (high dissolved mineral content) has a higher pH compared to soft water (low dissolved mineral content). In order to lower the pH, the water needs to be softened by lowering the dissolved mineral content. 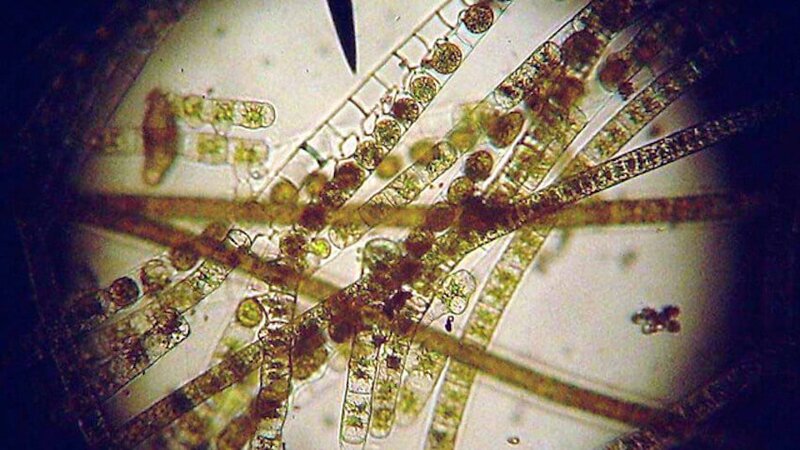 This can be achieved by using peat moss, or using demineralized water for water changes, such as R/O water or distilled water. Nitrates can effectively be removed using Algone. Causes for high nitrates can be overfeeding, overstocking, and a relaxed maintenance schedule. my ph & nitrates are always high & my water is hard or very hard what can I do to fix these?